Millions of pounds has been awarded to build the first major park and ride scheme serving Durham city centre. The £9m scheme will see three car parks built on the edge of Durham at Belmont, Sniperley and Howland's Farm, linked to the centre by frequent bus services. It is aimed primarily at commuters and all-day visitors, freeing-up spaces in the city centre for shoppers. Work will start in April and the scheme is set to be operating in time for this year's Christmas shopping period. 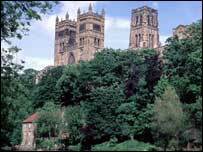 The funding, allocated to Durham County Council, was announced on Wednesday by Transport Minister Charlotte Atkins. She said: "This is great news for people who live or work in Durham or who travel there on shopping and leisure trips. "I'm delighted to be able to approve funding for the North East's first major park and ride scheme. "It will improve access to, and promote the vitality of Durham city centre as a major employment, shopping and tourist centre as well as protecting its unique historic environment."